Very private luxury villa on oversized lot in oceanfront neighborhood located 15 min east of Willemstad in the Jan Thiel area. It has grown to become the most desirable upscale beachfront neighborhood in Curacao. Very laid back residential style but with a full leisure service infrastructure. The house is located 300 yards from the beach. There you'll find two beaches (dive school and catamaran sailing), five restaurants (ranging from beach bar style to fine dining), coffee+gelato shop,boutiques and a gym. There's a 10 mile (world champion) mountain bike trail starting 200yds from the house. Little under a mile the other way (at the inlet) is a marina. All the while the house serves as your private oasis in the middle of it all. 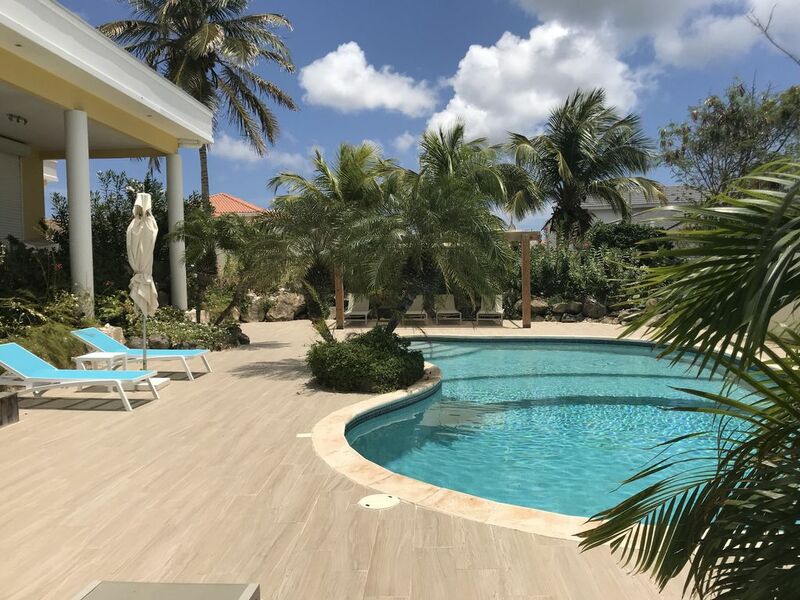 While I would recommend you go see the island and Willemstad, you can equally spend a private resort style resort style vacation just within the walking radius from the house. The house is perfect for a relaxed vacation in beautiful Curacao. In- and outdoor living: Just like its name implies, Villa Royal is large and beautiful! This modern villa was built just a few years ago on a large plot at Vista Royal. The plot area is well over 2000 m2! The villa has 4 bedrooms and 4 bathrooms and is extremely spacious. And of course, it has all the luxury you would expect. The living room is large but cozy at the same time. The sliding doors allow you to merge the indoor and outdoor life together. Feel like watching screen television is hooked up to the cable network, which gives you access to countless stations, including all the major US networks. The kitchen is truly amazing, every little detail has been given attention. All kinds of appliances are at your disposal and the double door refrigerator has plenty of space for large parties. If you enjoy cooking your own meals, the large stove and cooking island make things as easy as it gets. The large garden has many different kinds of palm trees, banana trees and other tropical vegetation. Right next to the pool you will find the barbecue area. The whole property is enclosed (6 feet stone wall) for your privacy and security. Scuba Diving in Jan Thiel : Scuba diving is huge in Curacao. Curacao is in the top 10 of best places to dive and it attracts drivers from all over the world. Jan Thiel Diving is only 2 minutes away form the house. The have beginners and advanced courses. Both my kids learned how to dive in 4 days (in 2007) at the Scuba Dive Center and both have been avid divers since then. It is an fun thing to learn and do for the rest of your life. We have been visiting Curacao since the 90's. Staying with friends, in hotels and renting houses. We chose this porperty because it has so many advantages. My family of 6 stayed in this villa for our week in Curacao. The location was wonderful. The market, Jan Thiel beach were in walking distance. The area felt very safe. The villa was gorgeous. It had plenty of room for us to spread out. The refrigerator broke shortly before we arrived, but the property manager was on top of it, and had moved it out of the way and brought in a replacement which had ample room for us. The villa has a lovely pool, which we used every day and was cleaned 2 times while we were there. The house has an open floor plan to catch the ocean breezes, and air conditioning in each bedroom to stay cool at night. There are lots of mosquitoes so bring bug spray; we used citronella bands which helped a lot. The kitchen was equipped, we didn't need anything that wasn't provided. There were plenty of outlets and adapters throughout the house, however I had also brought an surge protector to charge all our devices. The wifi was great in the house, but a little spotty outside. The villa had everything we needed for a fabulous vacation. We stayed with 4 adults, 2 you children and a teenager. Everyone loved the house. It was well laid our for us. The pool was surprisingly large. We have stayed on the island before. Jan Thiel is the perfect location to be near the beach, food shopping and many things to do. I've stayed many places and this was the best! Searching for our vacation destination was largely determined by this property. The location was central to all of the beaches, shops and activities you could want on a vacation. The rental process was easy and communication was great throughout the booking process, upon arrival and during checkout. There were 4 adults and we went slightly over our electric allowance for the week but only resulted in an extra $10 charge. The pool was amazing. Perfect refreshment from the warm sun after a day at Kokomo Beach, atv exploration of the island, a day off-shore fishing with Captain Gordo or shopping at the port. Open living at its finest, don't forget to pack bug spray. There are mosquitos! Boasae is an amazing dinning experience and the best on the island, definitely a must!! The house was well stocked with towels for showers and the beach. We cooked some breakfast and lunches and had everything we needed in the kitchen to do so. Our only complaint-our vacation ended. We loved our January 21-28, 2017 stay, another VRBO vacation success. Three couples spent a week diving and always rent a house rather than hotel rooms. This place was beyond amazing. The pool is big and clean, the rooms are outstanding and the rest of the house is well appointed. I cannot say enough good about the place. Once you get your bearings, it is an easy drive to town or grocery. There is a great sushi restaurant just down the street. This house exceeded our expectations! The bedrooms and common areas are all very spacious, comfortable and beautifully appointed, the ambiance one of pure delight and relaxation. For a family of 7, we had ample space to hang out together. From the veranda you look out onto a tropical paradise of desert like plantings surrounding a good sized in-ground pool large enough for laps. The owner was very easy to work with and very responsive; the property manager was available to us whenever we needed him. We felt very well taken care of. The kitchen is superbly equipped. The villa is conveniently located in the neighborhood of Jan Thiel where you can find a lovely Dutch supermarket, restaurants right on the water, bars, etc. Good for the young crowd as well…We've returned home with wonderful memories of our stay at this villa! I rented the home and SUV for an extended family of seven. We were delayed by mechanical issues with our flight. We were scheduled to arrive at 8PM, but when we actually arrived after midnight the driver was there and they property manager met us at the home to check us in. They had just installed a beautiful new refrigerator and although they we're having issues with the ice maker and minor issues with a light in the bedroom and one of the shutters, everything was explained. The home is as described in the listing. We loved the pool and back yard area. We kept the house open to the outdoors when we were home. We ran the dishwasher, and washing machine daily and the bedroom air conditioners at night and had no issue with the electricity allowance. It's an easy walk to the beach, a grocery store, a wonderful restaurant called The Pier or to a catamaran sailing trip. We also did excursions with SUP and ATV Buggy Tours. They both picked us up at the home. The owner is excellent at returning emails and answering questions.